We have two kitties that are a big part of our family. We got them when they were about 6 weeks old and had been dropped off at our vet's office. They are brother and sister….my kids named them Salt and Pepper! 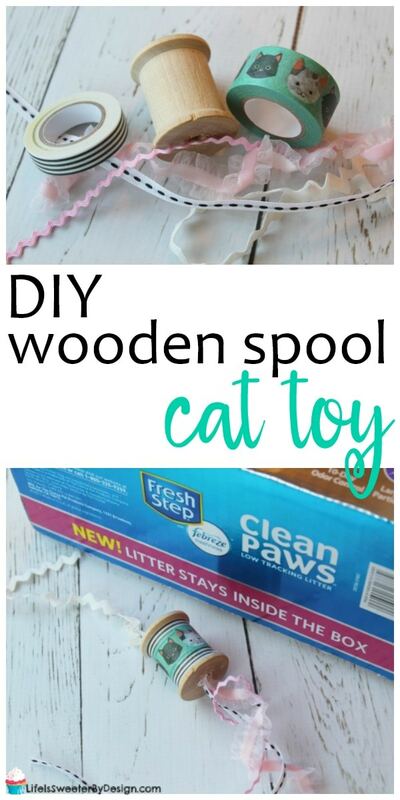 🙂 I was in the mood for a little DIY project and decided to make a DIY wooden spool cat toy with some old wooden spools I had. 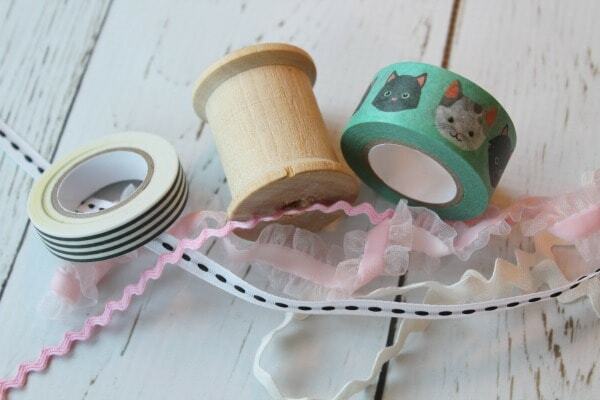 This is such an easy DIY…it only takes a few minutes, but will bring your cat a lot of fun playtime! Our cats are getting older…they are over 14 years old! The funny thing about it is that they have gotten more loving as they have aged. They still like to play too. Having two cats can sometimes create unique issues. One thing my cats love to do is play hard in the middle of the night. Sometimes they run so fast it sounds like elephants in the house, LOL…and yes…it wakes me up! Another thing that happens with two cats is that I have twice the litter tracked around the house. This is not my favorite part of being a cat mom. 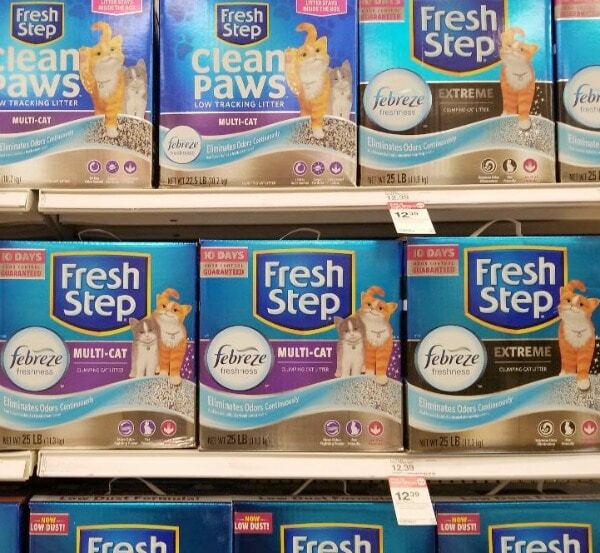 I was really excited to see Fresh Step® Clean Paws™ Multi-Cat Scented Litter with the power of Febreze™ Freshness when I was shopping at Target recently. 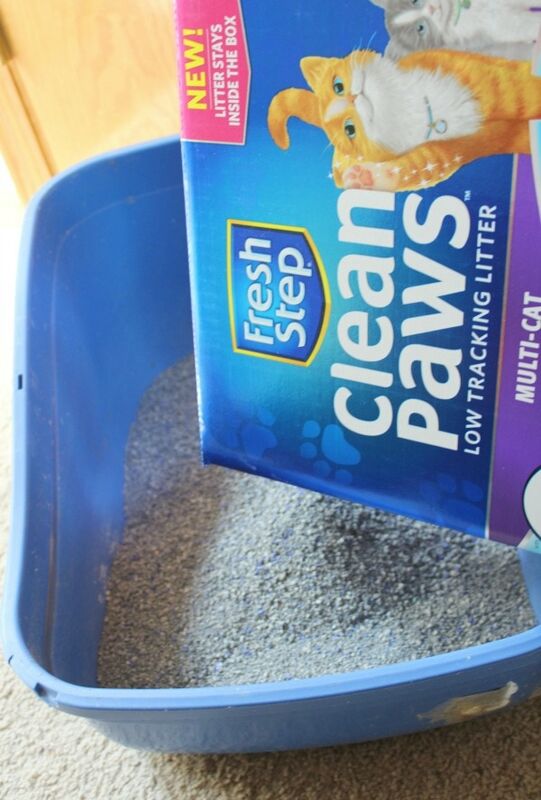 A litter that can help keep paws clean…so my house stays cleaner…YES! I love how this low dust, low tracking litter works. Did I mention that it is perfect for multiple cats. It has increased odor-fighting protection with the power of Febreze™ Freshness and 10-day odor control. Less litter tracking equals a cleaner house and that means more time to play with the kitties! 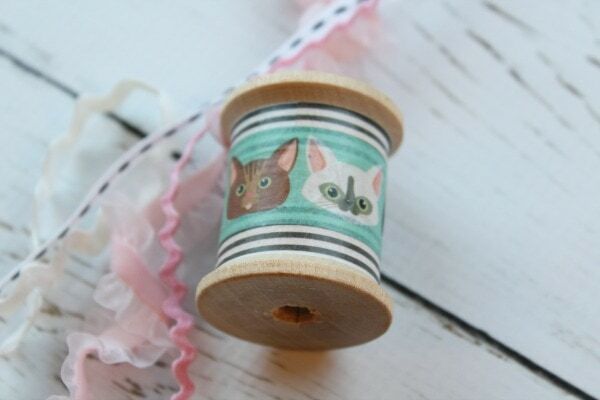 The first step is to wrap the center of your wooden spool with washi tape. You can use any tape that you have on hand. I happened to find some CAT washi tape and thought it was PERFECT for this project! I used some black and white striped tape to border the cat tape. 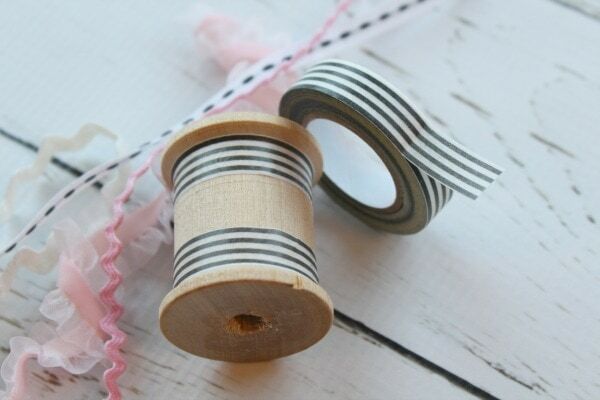 Washi tape is so easy to reposition that you can't make a mistake! Next I glued one ribbon on one end of the wooden spool. I just put some hot glue into the top hole and stuffed the end of the ribbon into the hole. I used a toothpick to push it down in the hole so I wouldn't burn my fingers. 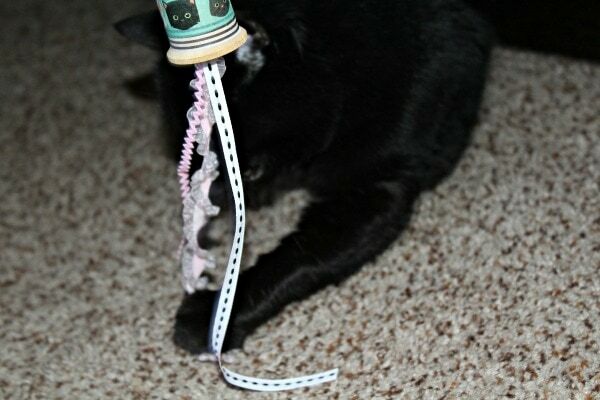 This allows you to hold onto the toy and move it around for your kitty. 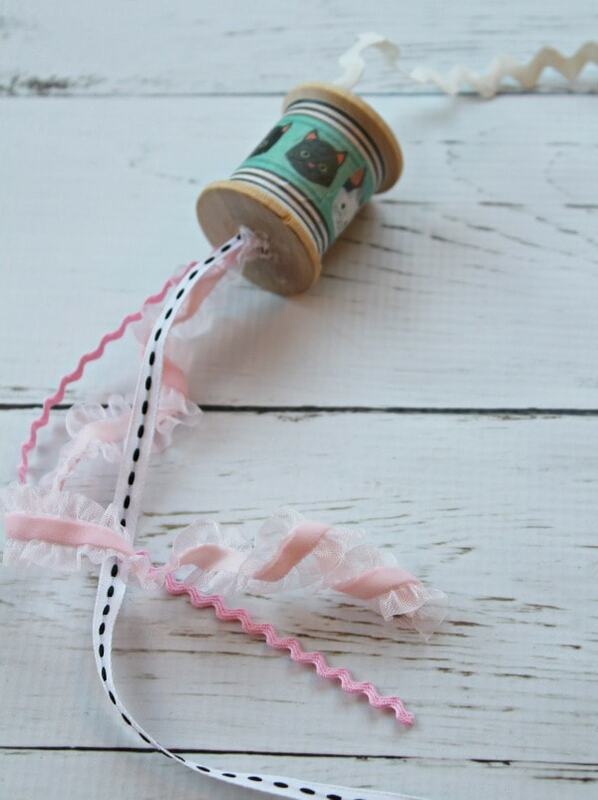 Last I took 3 ribbons and put the ends together. Then I put hot glue into the bottom hole and pushed the ribbon ends inside to glue them into place. This project literally took me about 5 minutes! How Many Kitties Do You Have? How many cats do you have? Did you let your kids name them, LOL? Be sure to check out Target Cartwheel offer from 4/1/18 to 4/7/18 to save some money on your next box of Fresh Step® Clean Paws™ litter. Let me know how your cat likes their new toy!